Normally we skip posting on Labor Day, but because of the missed page from the server issue, Diane and I decided to upload one for today. 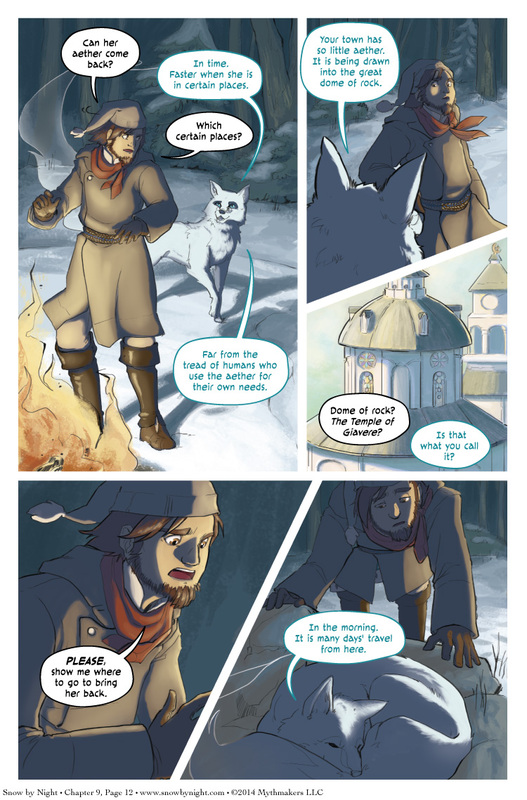 Paws offers Blaise a way to bring Snow-by-Night back on Chapter 9 Page 12. Paws also drops a small hint about where all the aether in Sherbourg is going. We have a scene shift for Wednesday’s page. To see who stars in this scene, please vote for Snow by Night on Top Web Comics. It’s a new month and the votes have reset. Help us climb the ranks of the world of webcomcic. So does that mean Giavere uses the aether to fuel powers on a more short-term basis? Or is she hoarding it for some reason? Or do the priests at the temple use it heavily enough that she doesn’t feel it? I mean, we haven’t seen any reason why aether would need to be renewed outside of tap-outs (although there is a cooldown on when one can tap their aether, implying a process of aether buildup), and it could just easily be that she has a nice consistent aether cycle going with no need for the inputs of Sherbourg or anywhere else. Of course, it could just be the simple answer of “She needs it because gods need prayer badly,” but then I would point to the fact that Father Winter needs no such worshippers as Giavere and the rest of her pantheon require. ‘ through these pages? It’s so heavy in that final panel. I wouldn’t expect it have the same shading as a human… But then Blaise has the same purples-gray on his brown coat and red scarf and skin. It appears that Giavere, at least, if not the rest of her “colleagues” (of whom I only Thaust has been mentioned in the Almanac), are consuming aether, which might explain the dearth of Manitou in Japethe – perhaps they’ve sucked it dry of aether not attached to corporeal beings (and disease spirits)! Would you like to hear about Giavere’s colleagues? I can focus on the Great Spirits in the Almanac for a little bit. Is this connected to what Snow was talking about on http://www.snowbynight.com/pages/ch6/pg28.php? Maybe. I’ll leave that up to you to decide.